Perhaps best known for being home to the Butternut ski area since 1963, Warner Mountain's ski history dates back to the 1930s, when the CCC cut two trails on the northern slope. 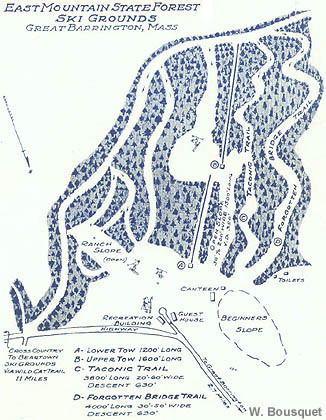 Later becoming part of the G-Bar-S Ranch, the trails were eventually incorporated into the Butternut Basin development and are still open today in modified form. 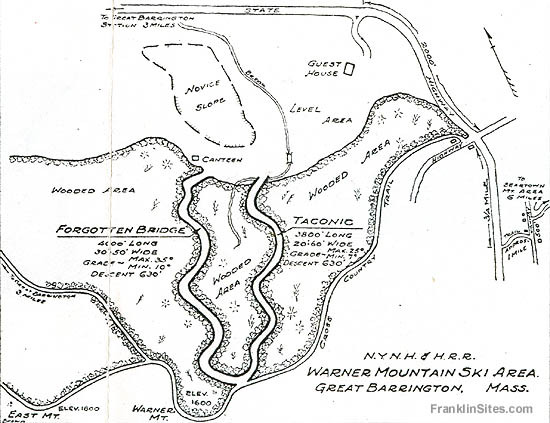 Taconic was cut as a novice/intermediate trail from the Appalachian Trail to the base of Warner Mountain in 1936. Considered to be the "sportier" of the pair of CCC trails, it was accessible via a series of rope tows during the G-Bar-S Ranch ski area operations. The trail became "Twist" when Butternut Basin ski area opened. 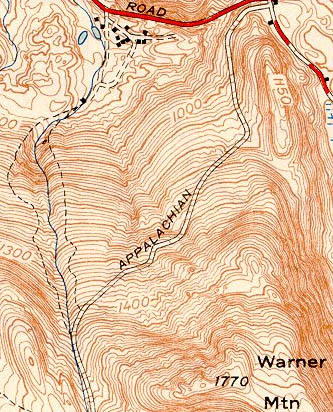 Forgotten Bridge was cut as a novice/intermediate trail from the Appalachian Trail to the base of Warner Mountain in 1936. Considered to be the less aggressive of the pair of CCC trails, it was accessible via a series of rope tows during the G-Bar-S Ranch ski area operations. 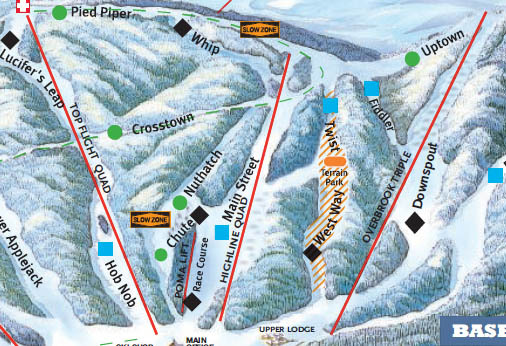 The trail became "Fiddler" when Butternut Basin ski area opened.
" 31. Gt. Barrington State Forest Trails. On north slope Mt. Warner 2.5 miles from town on Rt. 7 to Rt. 17, right for 2.2 m. 200 yds. from plowed road. Taconic Trail. Class: intermediate and novice. Length: 0.7 m. V.D. 630'. Width 20-60'. M.G. 25 deg. D.S. 4". Wide, smooth, many turns. Safe for all classes. Forgotten Bridge Trail. Class: inter. and novice. Length: 0.8 m. V.D. 630'. Width 15-50'. M.G. 31 deg. D.S. 4". Parallels Taconic Trail, connecting at top. Uphill section at bottom of steep pitch. Small slopes. " Great Barrington...Three and one-third hours from New York on the Snow Express. Two magnificent trails four thousand feet long on East Mountain with a descent of four hundred feet. Open slopes for novice skiers. Other interesting, recently developed runs. Two ski tows making it possible to reach the summit of the trails. The Appalachian Trail on the ridge of East Mountain has been made into a road sixty feet wide. The road provides an excellent trail for beginners as skiers have exclusive use of it during winter months. This winter sports area is operated and maintained by the G-Bar-S Ranch. There is a well appointed canteen and ski repair room. All day use of ski tow $1.00. The location is three miles from the railroad station. Bus transportation 25c each way, approximately fifteen-minute trip. " "New Ski Center at Great Barrington Ready, Like Other Snow Train Areas - Except For!" The Berkshire Evening Eagle. Dec. 1936.